Mommy and I took Daddy to Mount Vernon for Father's Day. We saw George Washington's house. We went to the farm and we went down to the water - it smelled kind of bad, but the breeze was very nice. 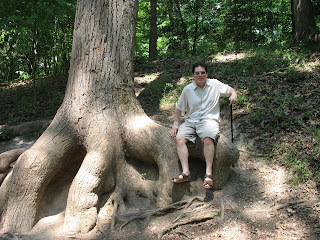 They have some really big trees at Mount Vernon. Daddy sat on one. Look how big! I bet that tree was really really old.